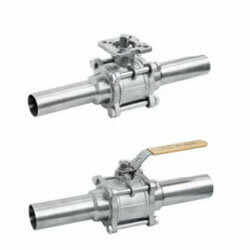 This ball valve has carbon steel body and alloy steel trim which is suitable for -40°C ~180°C. Thanks to a new Carbon reinforced PTFE seat and sealing, the stainless steel wafer ball valve is suitable for various media, such as Q41F-(16-40) C water, oil, steam, Q41F-(16-40) P Nitric acid, Q41F-(16-40) R Acetic acid, etc. Besides, this three-piece welded ball valve with extended pipe is designed to avoid leakages and fugitive emissions in the environment. This ball valve has identical features, such as nominal pressure should be PN1.6, 2.5, 4.0, 6.4Mpa. The strength testing pressure will be PT2.4, 3.8, 6.0, 9.6Mp. Low seat testing pressure is 0.6Mpa. And high seat testing pressure will be 1.8, 2.8, 4.4, 7.1Mpa.